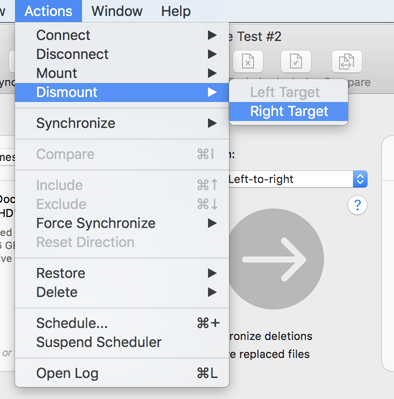 ChronoSync 4.8.x, alongside macOS High Sierra is demonstrating a problem with maintaining connections to external drives. 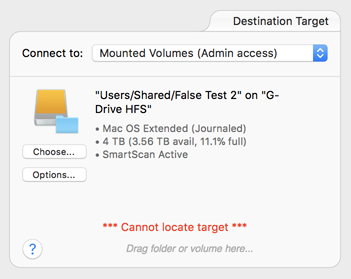 The macOS connects each external drive using a 'mount point.' These mount points are all created in the hidden "/Volumes" folder on the startup volume. 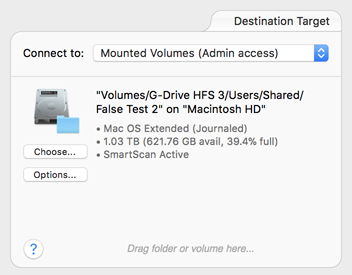 When using High Sierra and ChronoSync 4.8.x, these 'mount points' can become confused and a folder can be substituted in lieu of the connection to the external drive in the '/Volumes' folder. We are naming this problem a 'False Mount Point.' This problem can result in files being backed up normally, but the destination actually being a subfolder of the '/Volumes' folder instead of actually being copied to the external drive. 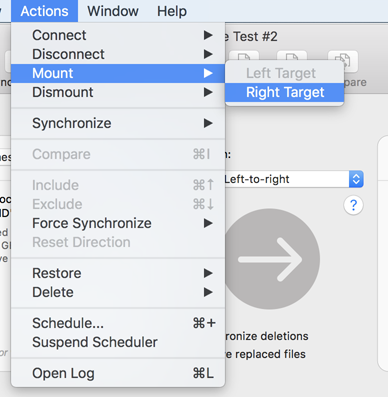 ChronoSync 4.8.3 corrects this problem and helps identify the problem with a new warning displayed in the 'Readiness' section of the Setup Panel of the Sync Task. If you think you are experiencing this problem, contact support. The remainder of this Tech Note explains how to remedy the situation and ensure your backups are working correctly. Here "Macintosh HD" is the system hard drive (the one that was booted) and the target path is rooted at "Volumes." It should really appear as: "Users/Shared/Files Test 2" on "G-Drive HFS." Notice that the drive icon correctly represents the external drive and that the description shows a path relative to "G-Drive HFS," which is the correct volume name. Save your changes and everything should be fine from here on. In some circumstances, it is possible that after you began incorrectly referencing your target, an actual false mount point was created. This could have happened if you lost connection to your target volume during a task run. To make sure you have not encountered this, perform the following steps. 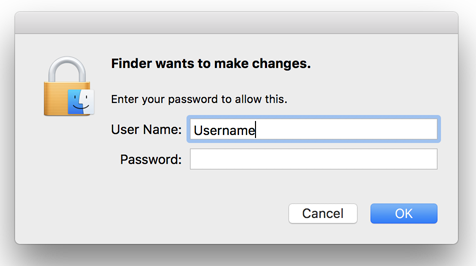 Open a new Finder window and type COMMAND-SHIFT-G on the keyboard. This opens the "Go to folder" sheet window in which you should type "/Volumes" and click "Go." Any folders that have variations of the name of the volume which you ejected are false mount points. In this case, the volume we ejected was named "G-Drive HFS." There are three variations of that name listed. You should select these folders in Finder and drag them to the Trash. You will need to supply your administrator credentials to do this. After dragging these folders to the trash, you should "Empty Trash" in the Dock. Your target should now be properly located. Run the task just to make sure everything is up-to-date. If you have further questions concerning this 'False Mount Point' issue, please contact support and we'll be happy to help! Nov-02-2017 - Created from Scratch.